1/1st, The Worcestershire Yeomanry, 5th Mounted Brigade, M.E.F. Walter Griffin was born in Worcester, the son of Mr and Mrs W E Griffin, (later of Hawkstone House, North Malvern Road). His two brothers, Cecil and Owen were also in the Worcestershire Yeomanry. His father was a cab proprietor and also ran the Supply Stores on Newtown Road (at Bedford House). Mr and Mrs Griffin received the news of the death of their third son Tpr Walter Neil Griffin, Worcestershire Yeomanry in December 1917. 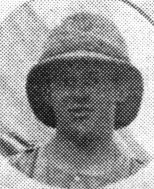 He was called up with the Yeomanry at the beginning of the war and went to Egypt in April 1915 for Gallipoli. Revd Maynard Smith, Vicar of Holy Trinity wrote a tribute to him in the Parish Magazine that month, and noted that he was a choirboy and server at the Church of the Ascension (strangely he is not commemorated here).